Chinese New Year, also known as the Spring Festival is the main Chinese festival of the year and it is not a religious event. As the Chinese use the lunar calendar for their festivals, the date of Chinese New Year changes from year to year. The date corresponds to the new moon (black moon) in either late January or February. This year the new moon falls on January 23rd. Traditionally celebrations last for fifteen days, ending on the date of the full moon. In China the public holiday lasts for three days and this is the biggest celebration of the year. Days before the New Year, celebrators clean their houses to rid them of lasts year's bad luck and make way for the in-coming good luck for the New Year. Celebrators buy plants and flowers that will bring them good luck for the New Year. The Kumquat tree is considered to be the luckiest because its name is a play on the word lucky. The peach blossom is also considered to be lucky and the markets are decorated with the delicate blossoms wrapped in tissue paper that stops them getting damaged. Fish is usually eaten on the eve of Chinese New Year. The Cantonese pronunciation of fish makes it a homophone for "more than enough", or "extra". Dumplings is eaten traditionally because the preparation is similar to packaging luck inside the dumpling, which is later eaten. Tangerines are lucky because of their bright color, but odd numbers are unlucky, so the tangerines are always given in pairs. Candy is eaten to ensure the consumer a "sweet" year. Red is the color for clothes and all decorations because it is associated with joy and happiness. 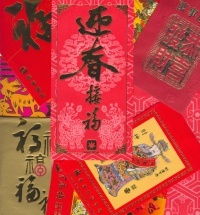 Lucky money is given out in red envelopes with the family name and good-luck message written on them in gold. They are given on New Year. Opening windows and/or doors is considered to 'bring in' the good luck of the New Year. Switching on the lights for the night is considered good luck to 'scare away' ghosts and spirits of misfortune that may compromise the luck and fortune of the new year. The loud noises are intended to frighten away evil spirits and bad luck that the spirits might bring.